New factsheet on cutlery and stirrers provides guidance on best material choice. The fourth in our series of Sustainable Future product factsheets launches this week, ahead of our sustainability themed stand at the Catering Equipment Expo (part of the Restaurant Show) on 1-3 October 2018. All four of the factsheets will be on the stand – evidencing our commitment to provide expert guidance to our customers on choosing the most material-responsible single-use products for their catering operation. As the public debate on single-use plastics continues to gain momentum, we are clearly articulating a factual response to our customers’ queries on Sustainability. When these queries relate to individual product ranges, we are presenting our customers with credible options for switching to an alternative material type. Disposable cutlery and stirrers are commonly provided with a variety of take-out dishes and beverages to allow customers to eat and drink comfortably on-the-go. Like straws; cutlery and stirrers are small, disposable items that have been under public scrutiny. Recently the EU proposed a total ban on plastic cutlery and straws to reduce single-use litter. When food served requires the provision of cutlery or stirrers, catering operators can choose from multiple material options, but there’s confusion about which option is the most environmentally responsible. 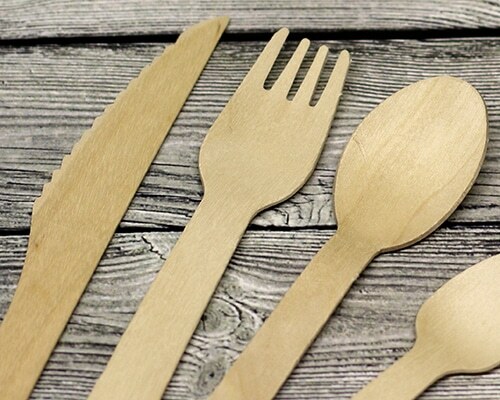 The new cutlery and stirrers factsheet presents a recommendation on what’s the most environmentally responsible solution, based on the UK’s current recycling infrastructure. It also looks at the options for switching to alternative material types (like wood or CPLA) and reducing usage via smart dispensers. These factsheets form part of our commitment to providing our customers, and the wider industry, with fact-based, jargon-free information on food packaging waste and recycling as part of our Sustainable Future 2018 framework. For more information about our Sustainable Future 2018 framework – please contact us today. This year, Bunzl Catering Supplies will be joining the Catering Equipment Expo with the theme of ‘Sustainable Future’.